Although Jonah Goldberg’s Suicide of the West borrows its title from James Burnham’s 1964 classic, it has more in common with Burnham’s The Managerial Revolution (1941), The Machiavellians (1943), and Congress and the American Tradition (1959). And it has echoes of Oswald Spengler’s The Decline of the West. Goldberg, a senior editor at National Review (where Burnham worked for more than 20 years) and a scholar at the American Enterprise Institute, also believes that Western Civilization is in peril, not, however, because of geopolitics but because too many Westerners are reverting to tribalism, populism, nationalism, and identity politics. Goldberg’s principal theme is that the tradition of English liberty coupled with the advances of capitalism gradually produced a “miracle” that we call western civilization, and that America and Americans have been its chief beneficiaries. Western civilization, he explains, is the product of culture, ideas and institutions, including Judaism and Christianity, the notion of limited government, religious toleration, private property, pluralistic institutions, a vibrant civil society, scientific innovation, the sovereignty of the individual, and the rule of law. The miracle of western civilization, Goldberg notes, has produced more wealth and more liberty for more people than any other civilization in history. It was a triumph, he writes, of the ideas of John Locke over the statist notions of Jean Jacques Rousseau. That triumph, however, was not inevitable and is not permanent. Indeed, Goldberg believes that it is currently in danger from tribalism, populism, and nationalism of both the left and right in American politics. 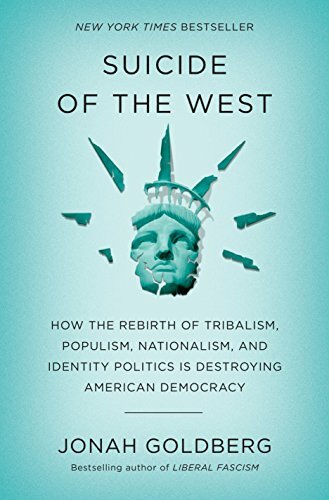 The reason for the success of the West, Goldberg contends, is that western ideas and institutions tempered and “civilized” the tribalism that is at the root of human nature. The American founders, for all of their inspiring rhetoric, viewed human nature in Hobbesian terms: nasty, brutish, and short. They wrote a Constitution and erected political institutions that brilliantly divided and diffused governmental power. Perhaps Goldberg has not read Burnham’s Congress and the American Tradition, a book that praised the founders for constructing institutional power struggles within the national government and between the national and state governments that gave effect to the parchment barriers to concentrated power contained in the Constitution. The Lockean Revolution that produced liberty and prosperity, however, came under repeated attacks from the American disciples of Rousseau in the 20th century. First the progressives, led by Woodrow Wilson, then the New Dealers under Franklin Roosevelt, and finally the architects of the Great Society under Lyndon Johnson expanded the reach of the state exponentially. Like Rousseau, Goldberg notes, American progressives “believed that human society could be directed, guided, and ultimately perfected by enlightened experts.” The creation and growth of the administrative state run by bureaucratic elites and managers, which Burnham earlier examined in The Managerial Revolution, corrupted the Founders project. Goldberg believes that the danger from the Left today is their victory in the culture war that has undermined the influence of important “mediating institutions”—the family, churches, and other voluntary associations that make up the “civil society” that stands between the individual and the state. The danger from the right, Goldberg believes, is the populism and nationalism represented in Donald Trumps’ takeover of the Republican Party and much of the conservative movement. He sees in Trump, and the conservative surrender to Trumpism, a reversion to tribalism that threatens to exacerbate the decline of Western Civilization. He fears that Americans have lost “civilizational confidence,” and unless that is reversed, it will lead to civilizational suicide. This book is a worthy successor to Spengler—and Burnham.